In December, 1884, William Morris, Walter Crane, Eleanor Marx, Ernest Belfort Bax and Edward Aveling left the Social Democratic Federation and formed the Socialist League. Strongly influenced by the ideas of Morris, the party published a manifesto where it advocated revolutionary international socialism. 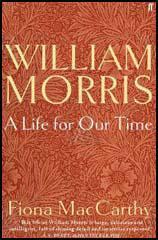 William Morris believed that the main function of all socialist organisations was to "educate the people". It was therefore decided that the Socialist League should publish a journal called Commonweal. Financed by a £300 loan from Morris, the monthly paper first appeared in February 1885 declaring that it had "one aim - the propagation of Socialism". The first edition of Commonweal had eight 15 by 10 inch pages and sold over 5,000 copies. 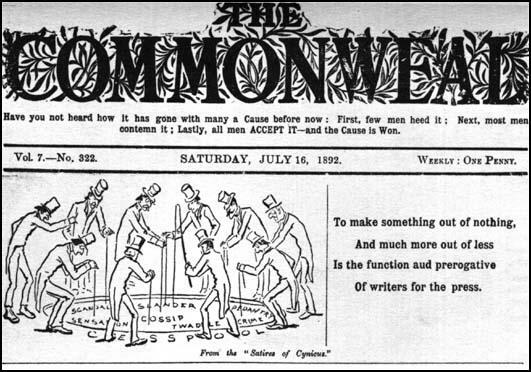 The Commonweal remained a monthly paper until it changed to a weekly in May 1886. Although the journal employed the talents of writers and illustrators such as William Morris, Walter Crane, Eleanor Marx and Edward Aveling, sales were disappointing. During industrial disputes such as the London Dockers' Strike, sales increased, but they fell soon afterwards. 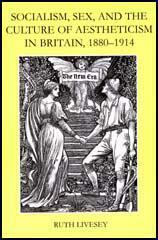 The Commonweal, with sales of between 2,000 and 3,000 copies a week, was costing William Morris about £500 a year. In 1895 Morris accepted defeat and the Commonweal ceased publication. possible for us, and that it is now our business to stretch out our hands and take it. between the confusion resulting from the breakup of that system and the determination to take in hand the labour now organized for profit, and use its organization for the livelihood of the community: to get people to see that individual profit-makers are not a necessity for labour but an obstruction to it, and that not only or chiefly because they are the perpetual pensioners of labour, as they are, but rather because of the waste which their existence as a class necessitates. All this we have to teach people, when we have taught ourselves; and I admit that the work is long and burdensome; as I began by saying, people have been made so timorous of change by the terror of starvation that even the unluckiest of them are stolid and hard to move. Hard as the work is, however, its reward is not doubtful. The mere fact that a body of men, however small, are banded together as Socialist missionaries shows that the change is going on. As the working classes, the real organic part of society, take in these ideas, hope will arise in them, and they will claim changes in society, many of which doubtless will not tend directly towards their emancipation, because they will be claimed without due knowledge of the one thing necessary to claim, equality of condition; but which indirectly will help to break up our rotten sham society, while that claim for equality of condition will be made constantly and with growing loudness till it must be listened to, and then at last it will only be a step over the border, and the civilized world will be socialized; and, looking back on what has been, we shall be astonished to think of how long we submitted to live as we live now.